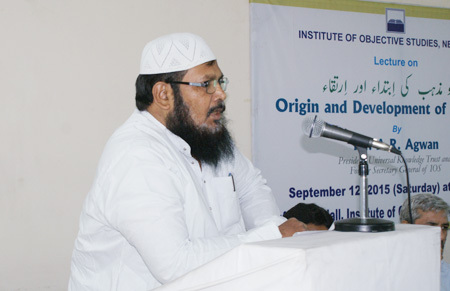 The Institute of Objective Studies organised a lecture on the “Origin and Development of Hinduism” at the conference hall of the IOS here on September 12, 2015. 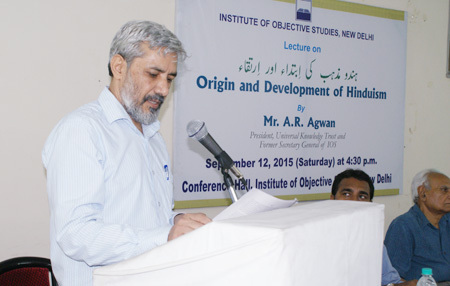 President, Universal Knowledge Trust and former Secretary General, IOS, A R Agwan, who spoke on the subject, held that two prominent views about the origin of Hinduism were prevalent. While one section of scholars and researchers believed that Hinduism had its origin in the present Indian territory, the other group, mostly led by Western scholars and indologists reached the conclusion that the Aryans were key contributors in the formation and development of Hinduism. He said that the origin of the word Hindu was itself debated by academics. The most argued interpretation could be that it had its roots in “Sapta-Sindhu”, which generally meant the area of the present-day Pakistan, Afghanistan and part of western India. He remarked that in the prevailing socio-political accounts, Hindus hardly took that territory as their “holy land.” They would also not like the word “Hindu” to be replaced by “Sindhu,” he said. He argued that the main hurdle in accepting Indian origin of Hinduism was archeology. The archeological evidence to prove either the so-called “Ramayana Route” or the existence of the people of the Mahabharata period could not be found out, creating doubts regarding the historicity of these major events imbedded in Hindu traditions. He said that no evidence of urbanisation in the present Indian Territory existed before the seventh century BCE. AR Agwan maintained that the nearest urbanisation in the ancient times had been found in the Indus Valley Civilisation during 3300-1300 BCE, but its main location was not the part of the present Indian territory. The mention of palaces, large populations and the existence of huge armies required advanced urbanisation which lacked in the present Indian territory created doubts about the claims. Referring to genome studies during the last two decades, he said that these had brought another challenge in understanding the origin of Hinduism. Although the Out of Africa theory had been propounded long back, the genome studies had recently substantiated it with the direct evidence imbedded in human genes. The theory, he said, underlined that the Modern Man was born in north east Africa, which fell in the present day Ethiopia and from there his descendants migrated to other parts of the world. Hindus, however, made its followers believe that the first man ever was Swayambhu Manu. He pointed out that if one believed the things in the Hindu way, he had to either accept that he and his early generations had existed long back in Africa or that he was not the first human being at all. He explained that the genom studies had also pointed out that Indian genes were an admixture of two kinds of genetic pools. The ancient one belonged to the African ancestors which became pronounced while going down to southern part of the country and the caste hierarchy. The other genetic pool became more and more evident going to northern areas and with the ascendance in the caste ladder and its origin in the Middle East and Europe. 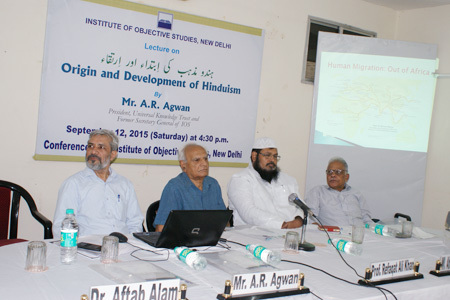 Mr. Agwan noted that the issue of the origin of Hinduism was complicated as its main upholders seemed to have migrated from other lands, and they would have contextualised their belief to the present Indian territory in later days, a process which was still going on. With the growing evidence, it was becoming increasingly difficult to accept that Hinduism in its present form would have originated in India. He called for taking up intensive academic and scientific research in view of its origin in the area around Afghanistan or in the Middle East or in Africa. In his expert comments, Secretary, Jamiat-i-Ulema-i-Hind, Maulana Abdul Hameed Nomani, argued that the issue of Hindutva was first raised by Hindu Mahasabha leader, Veer Savarkar in 1932. The concept of Hindutva rested on a negative thinking. Commenting on the contradictions in Hinduism, he said that there were as many as 300 types of Ramayanas in circulation in the country. He contended that there was no concept of history or historicity in India as poetry, philosophy, music, song, etc. formed basis for description of anecdotes. He said that since no organised and complete history was available, the Ramayana, Mahabharata and Vedas were the only sources of knowledge about Hinduism. While in Islam, there was faith, guide and guidance, no such thing existed in Hinduism, he added. 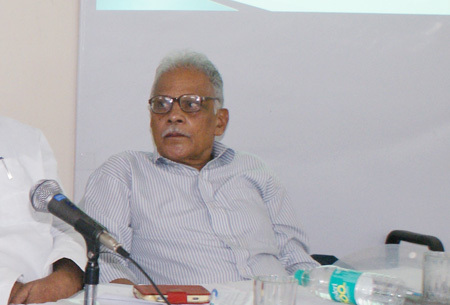 Former Head, Department of Buddhist Studies, Delhi University and former Vice-Chairman of the IOS, Prof. Sanghasen Singh, who presided over the function emphasised the need for further discourse on the subject. He urged the Muslim scholars to come out of their shell and produce standard works on Hinduism as German and British indologists like Max Meuller and MacDonnell did. He especially referred to MacDonnell who prepared Vedic grammar. Describing Hinduism as a complicated religion, he said that its development was circuitous. It was still growing with the protagonists of Hindutva making every attempt to assimilate other religions, like Jains, Sikhs, Buddhists with Hinduism. The idea of pan-Hinduism was punctured by Dr BR Ambedkar at the Round-Table Conference in London in 1930, when he declared that he was not a Hindu. Commenting on the Varna (caste) system, he said that the scope was widened with the passage of time. Under the caste system, Brahmins were placed at the top of the ladder followed by Kshatriyas, Vaishyas and then the Shudras (untouchables). Similarly, ashram vyawastha (stages of life) was devised to regulate life of practitioners of Hindu religion. He briefly gave an account of the five periods through which Hinduism grew and developed, including the “Hindu Renaissance” in the 18th and 19th centuries. In this connection, he especially mentioned the names of Raja Ram Mohan Roy, Swami Vivekananda and Ramkrishna Paramhans, who were responsible of the revival of Hinduism. 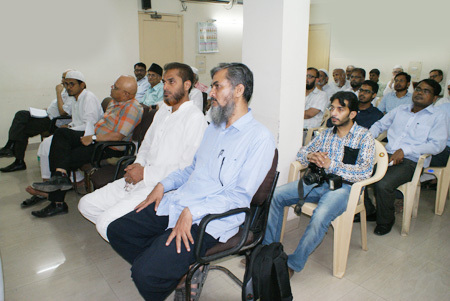 While the function opened with the recital of a Quranic verse by Hafiz Athar Husain, Dr Aftab Alam, Asstt. Prof. of Political Science, Zakiar Husain College, introduced the subject and conducted the proceedings. The function was attended by scholars, research scholars, university teachers, social activists and prominent citizens, including the IOS Vice-Chairman, Prof. Refaqat Ali Khan, M. Aqueel Khan, Sanaullah, T. Shamsuddin, Syed Ashraf Rizvi, Mumtaz Ahmad, Prof. Iqbal Husain of JMI, Nandlal, PK Raghu, Dr. AN Siddiqui, SM Shahid Jabbar, Shamshad Ikram, Mohammad Imran, Asrar Jamai and KR Bharti.